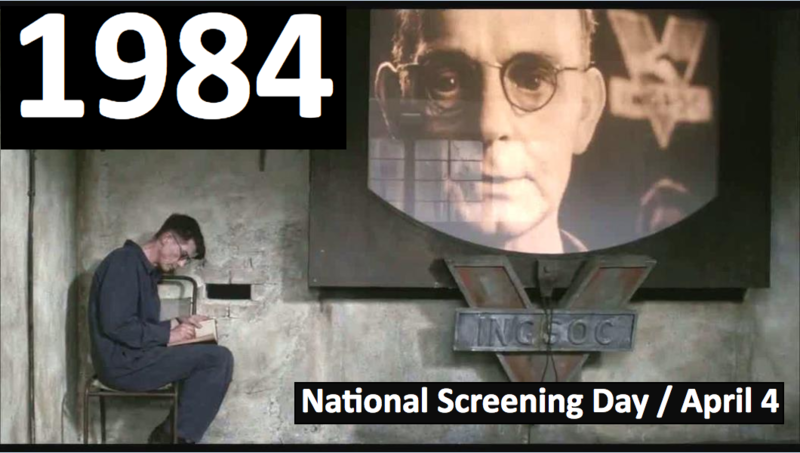 On April 4, 2017, at 7:15 pm we will be one of over 140 art house movie theatres across the country in 124 cities and in 41 states, plus four locations in Canada, to participate collectively in a NATIONAL EVENT DAY screening of the 80's movie 1984 starring John Hurt, who sadly died in January. This date was chosen because it's the day George Orwell's protagonist Winston Smith begins rebelling against his oppressive government by keeping a forbidden diary. These theaters owners also strongly believe in supporting the National Endowment for the Arts and see any attempt to scuttle that program as an attack on free speech and creative expression through entertainment. This event provides a chance for communities around the country to show their unity and have their voices heard. Our ticket price for this Special Event is $15 for all seats. We will let the audience vote on which of the following social action groups to which we will donate at least one-third of all net ticket sales: National Endowment For The Arts, or American Civil Liberties Union (ACLU), or Integrated Refugee and Immigration Services of Connecticut (IRIS CT). As we expect this event to sell out we will continue to consider additonal dates and times. We are thankful to announce that Dr. Beverly Gage of the Yale University History Department will speak after the screening. She will also take questions from the audience. Beverly Gage is a historian of 20th-century American politics and society, and Professor of History at Yale University. Her courses focus on modern American political history, with an emphasis on the intertwined histories of liberalism and conservatism, communism and anticommunism, and the craft of historical writing. Professor Gage has made numerous appearances on PBS News Hour. Click here to read more about Beverly Gage.